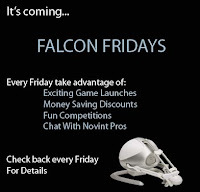 OFFICIAL NOVINT BLOG: Announcing... Falcon Fridays! Every Friday we’ll have a special game promotion. We could release new titles, offer special deals on games, host competitions, host chats with our CEO -Tom, and so much more! The featured games will be kept top secret until midnight (PST) on Friday. The Novint Blog is the only place that will announce the featured titles with the links for that Friday. But you’ll have to act fast, the deals will end once Friday’s over. Falcon Fridays are starting this Friday so don’t forget to check out the blog! What games would you like to see featured? Let us know below!